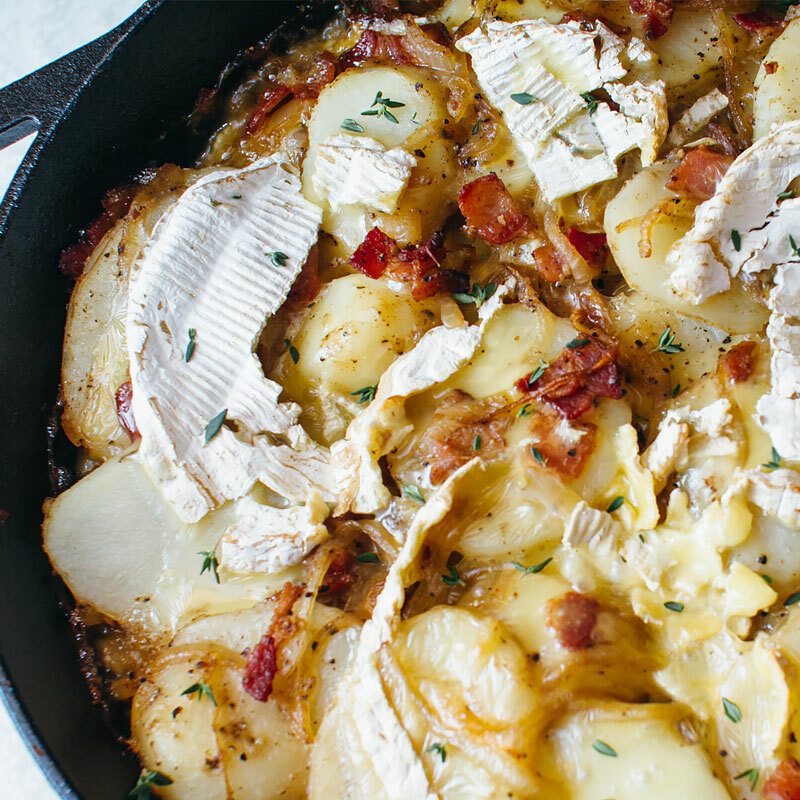 The first time I ever had tartiflette, it was from the frozen food section of a Parisian grocery store. I was visiting my best friend who was going to school in Paris at the time, and I was amazed. How could something be so delicious from the frozen food section? 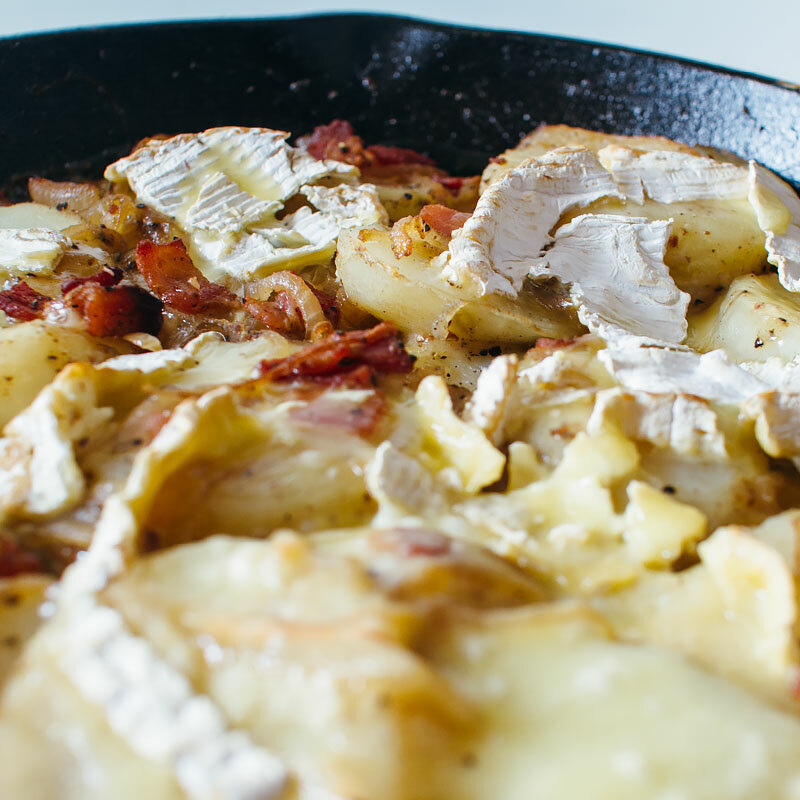 Because potatoes, bacon and cheese. That’s how. 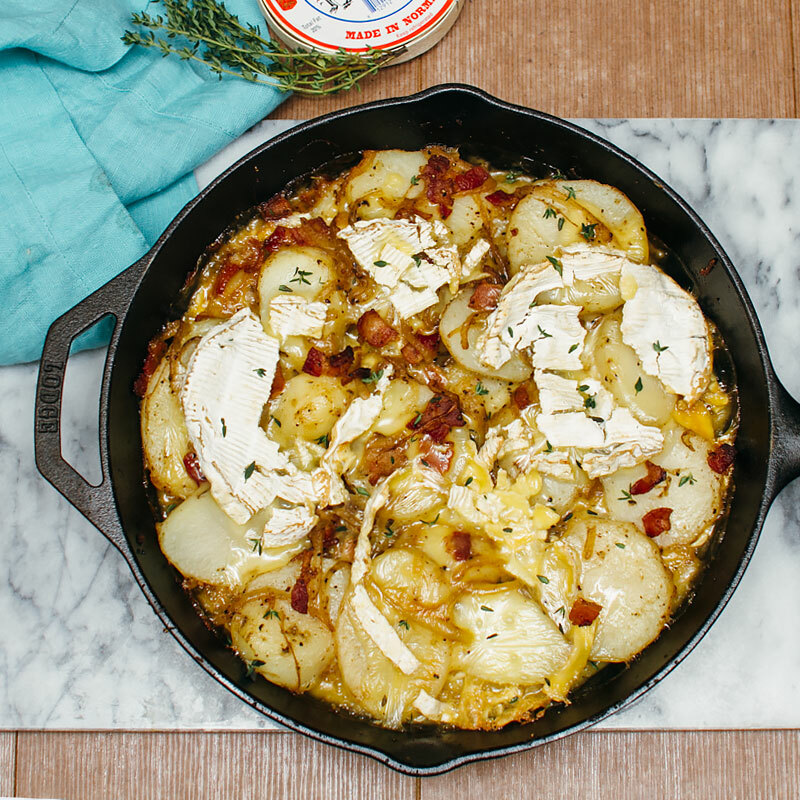 Traditionally, tartiflette is made with roblechon cheese. 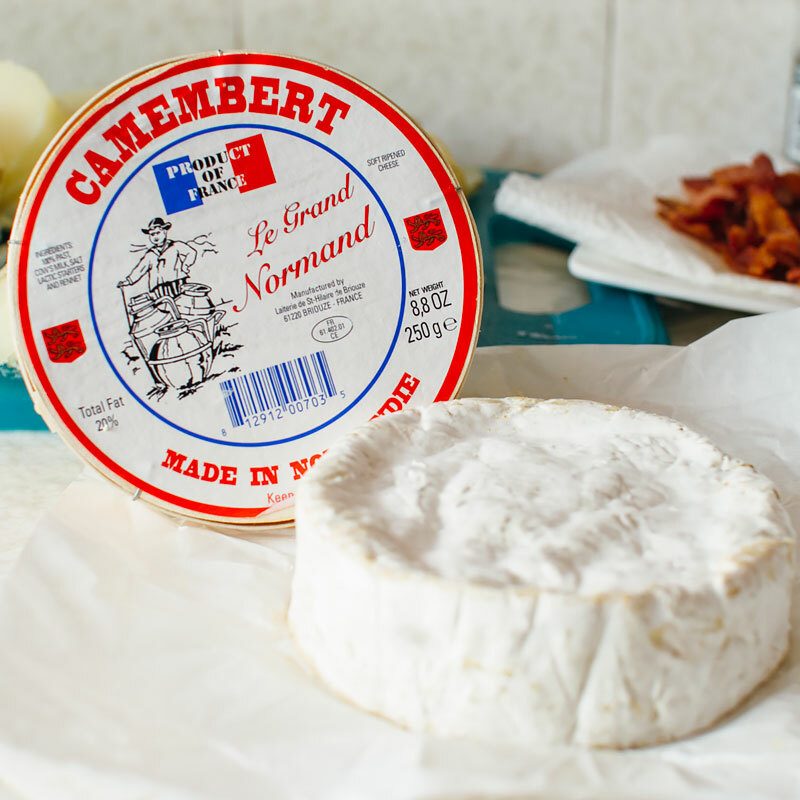 I couldn’t find it locally, so I substituted camembert. 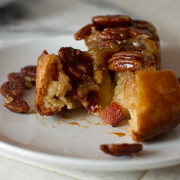 I’ve also made this with brie and it was delicious! 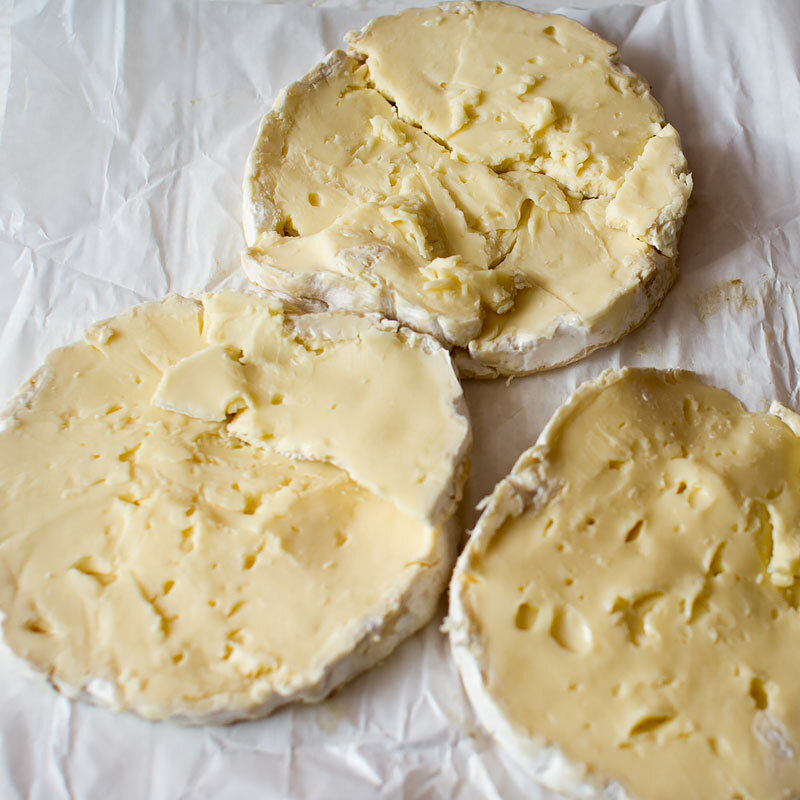 Some people hate the rind on these soft cheeses – feel free to remove it completely before adding to the dish. I happen to LOVE cheese rind, so I left it in. 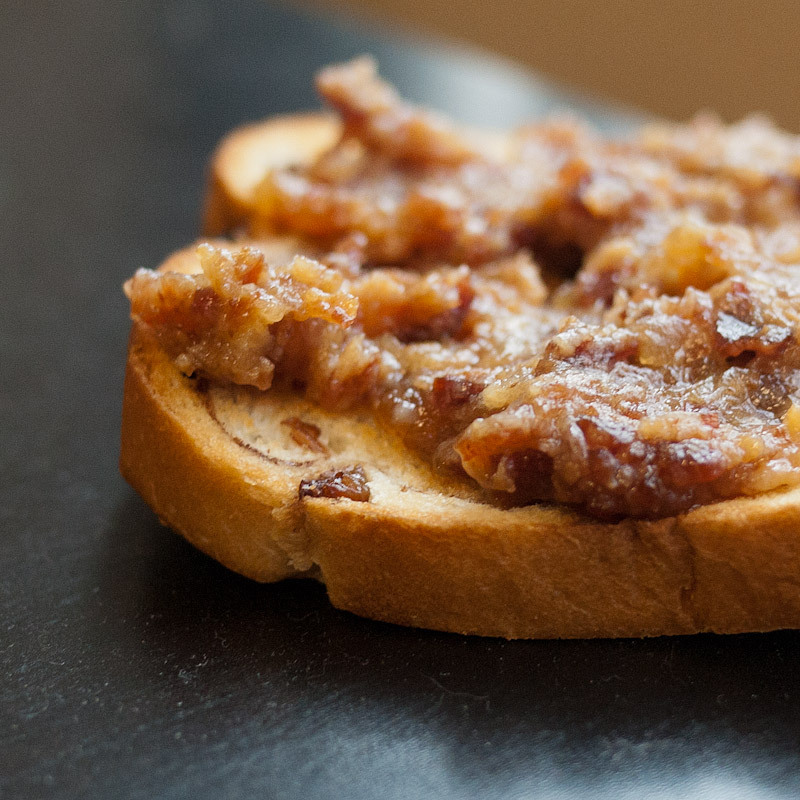 I also love the little bit of crunchy texture it adds. 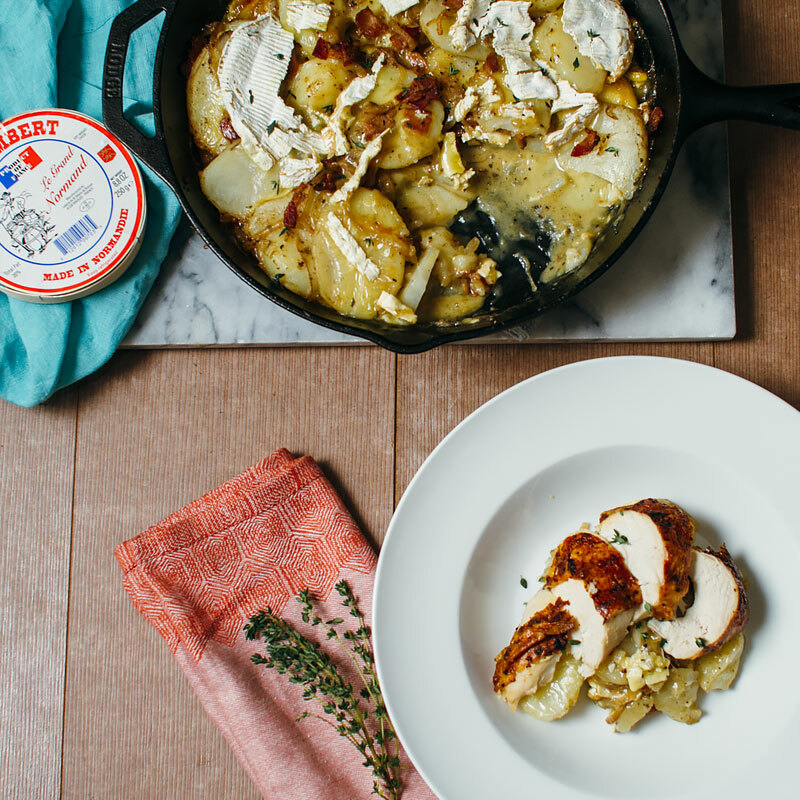 You’ll need bacon, camembert, wine, salt, pepper, potatoes and onion. 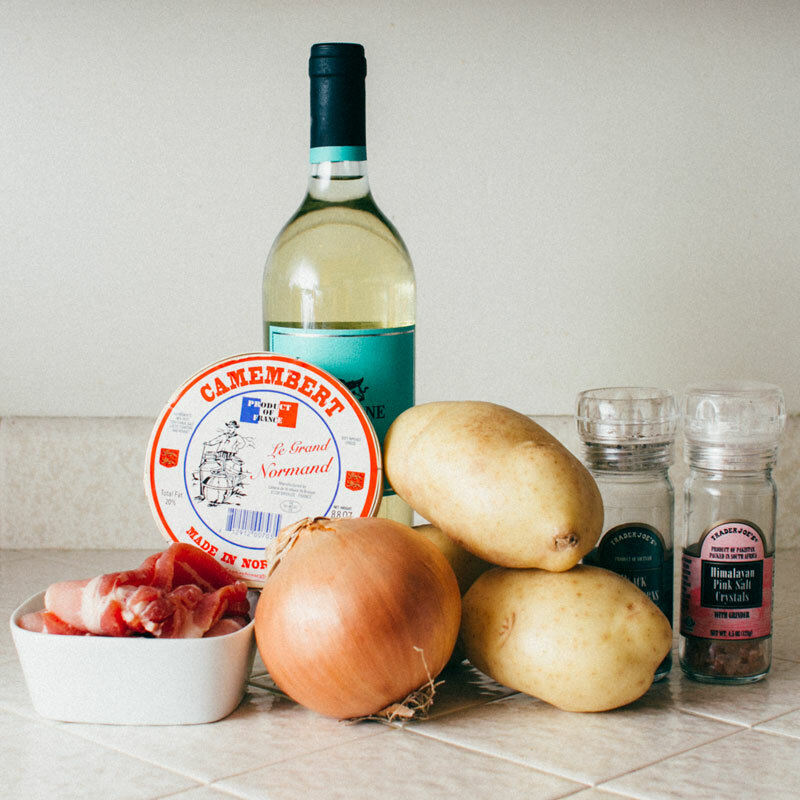 I use either camembert or brie for this recipe, because I have yet to find roblechon at my local cheese shops. Damn you, delicious elusive cheese! Slice the cheese up – I sliced it the hard way because I think it’s prettier. Slicing in into strips is juuuuust fine, guys. It all just melts together anyway. Set it aside. Boil the potatoes until just tender, about 20 minutes. Once cool enough to handle, slice into 1/4″ slices. You could also dice them up – chef’s choice! 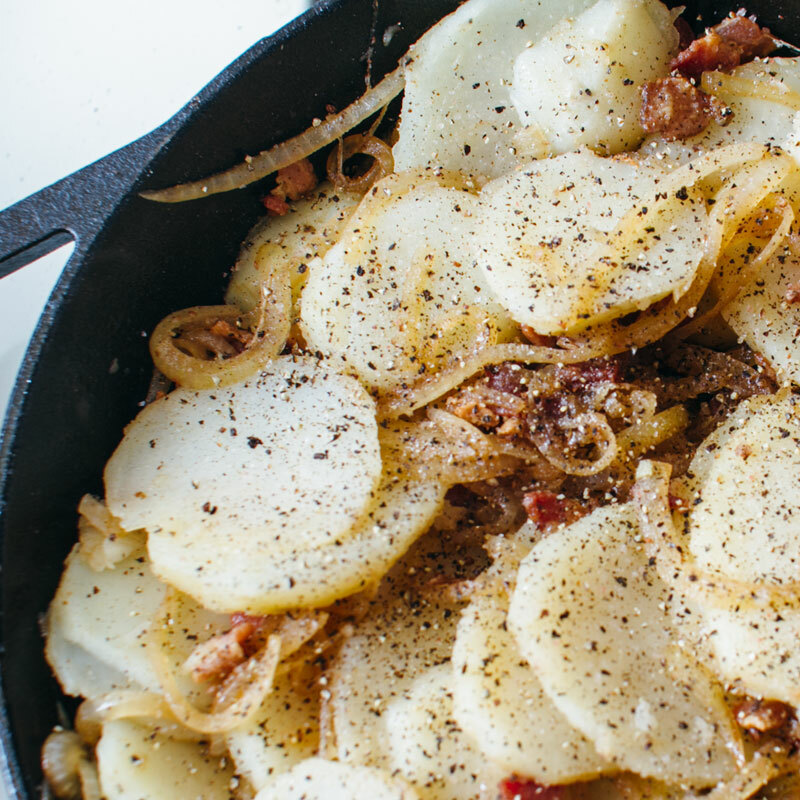 While your potatoes are boiling, you can start on the bacon and onions. 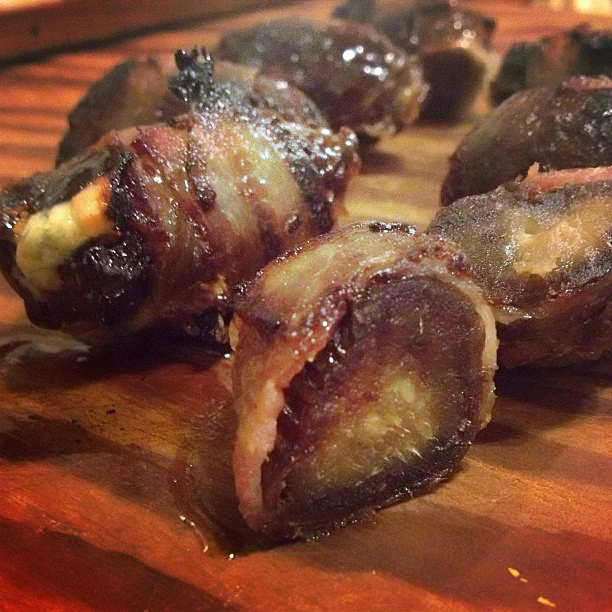 Cut the bacon into 1/2″ pieces and saute until browned and crispy. Drain on paper towels and set aside. DO NOT EAT ALL THE BACON. I know it’s ridiculous to put a plate of crispy bacon in front of someone and not expect them to eat it. I know you want to, ’cause I wanted to. You can have a few pieces though, I won’t tell. Drain off all but 1 tbsp of the bacon fat from the pan. 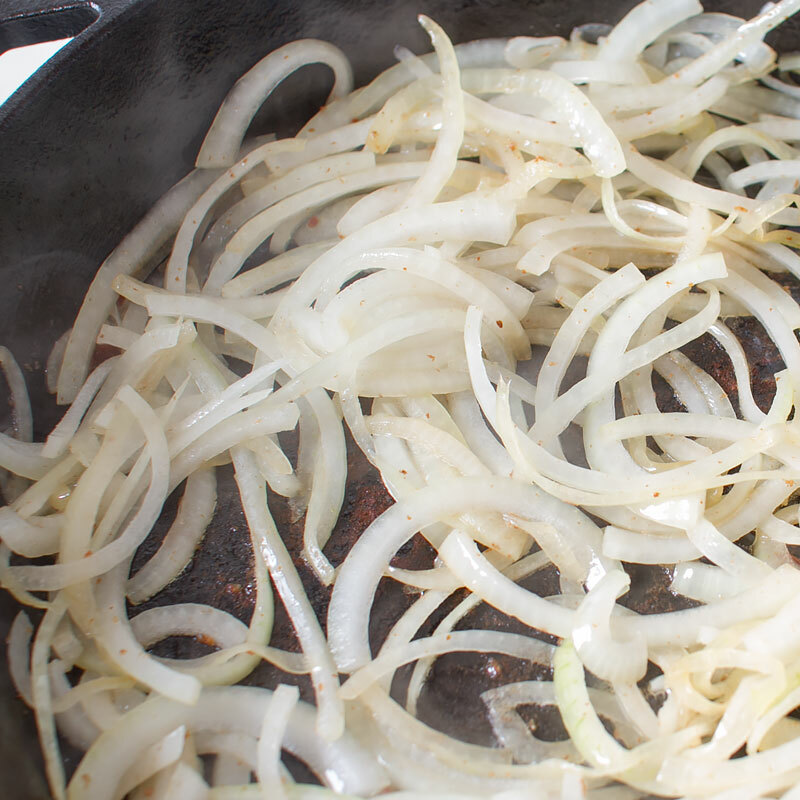 Add in the onions and saute over medium-high heat until browned, about 5 minutes. Add the bacon and wine to the onions in the skillet and let the wine cook down, about 5 minutes. Add the potatoes back in and stir to combine. Remove from the pan from the heat. 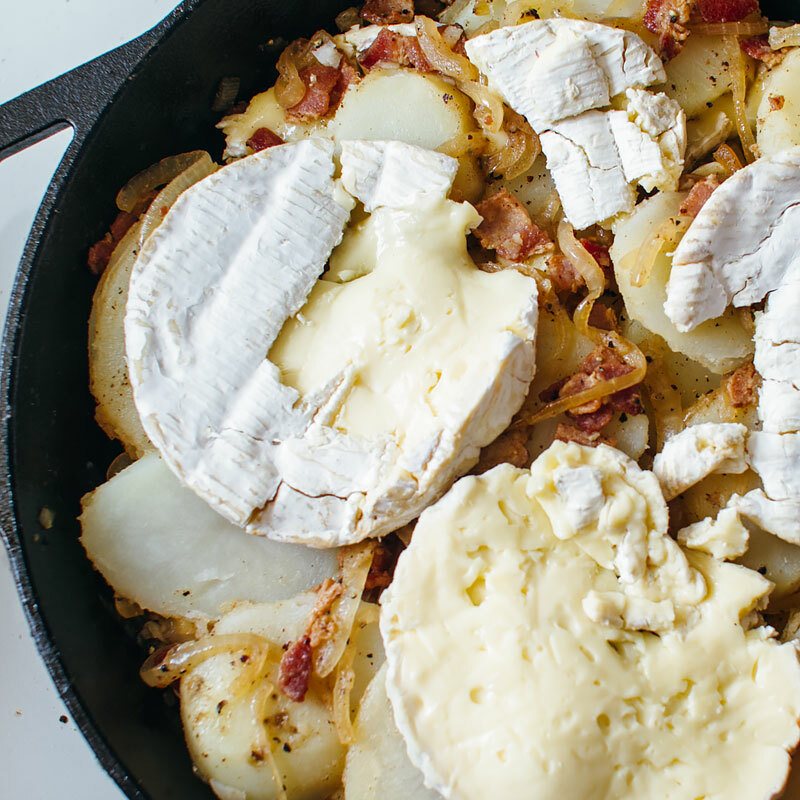 If you’re cooking this in a cast iron skillet, remove half of the potatoes (just throw them in the pot you boiled the potatoes in) and layer half of the cheese. 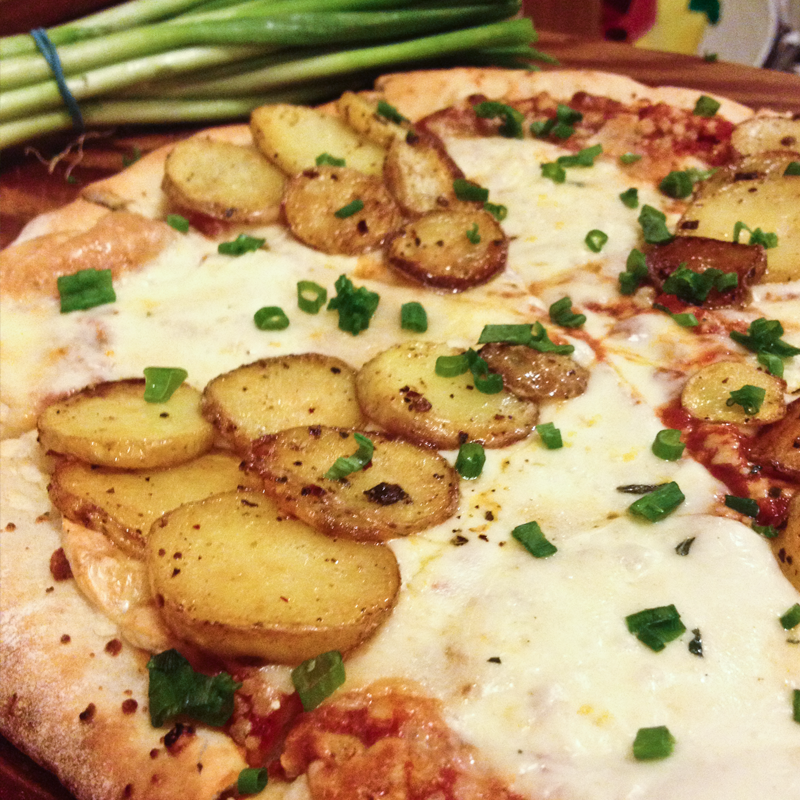 Top with the remaining potatoes and the last of the cheese. 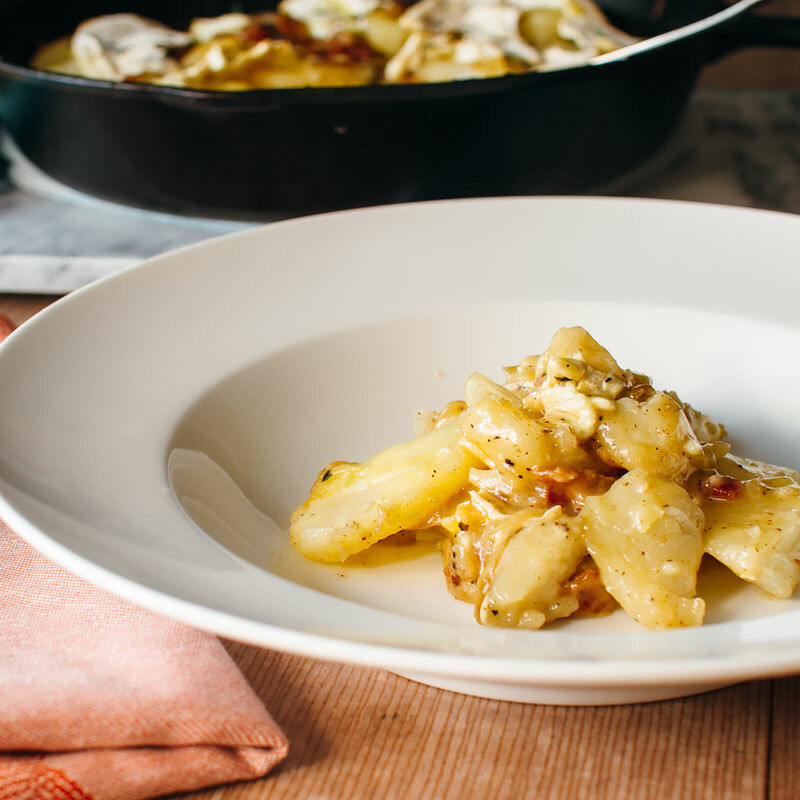 If you’re not using a cast iron skillet, place half of the potato mixture in a baking dish, followed by half of the cheese. Finish off with the rest of the potatoes and the rest of the cheese. 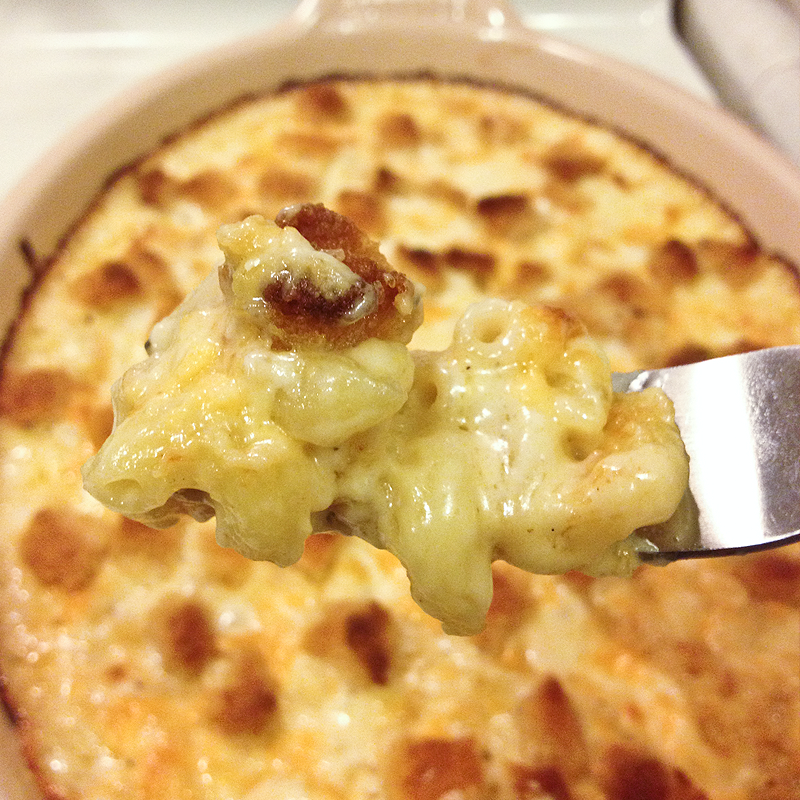 Bake at 350F for 20 minutes, until cheese is melted and bubbly and awesomely awesome. That’s it! I think it’s easier than mashed potatoes! Garnish with a bit of fresh thyme leaves. 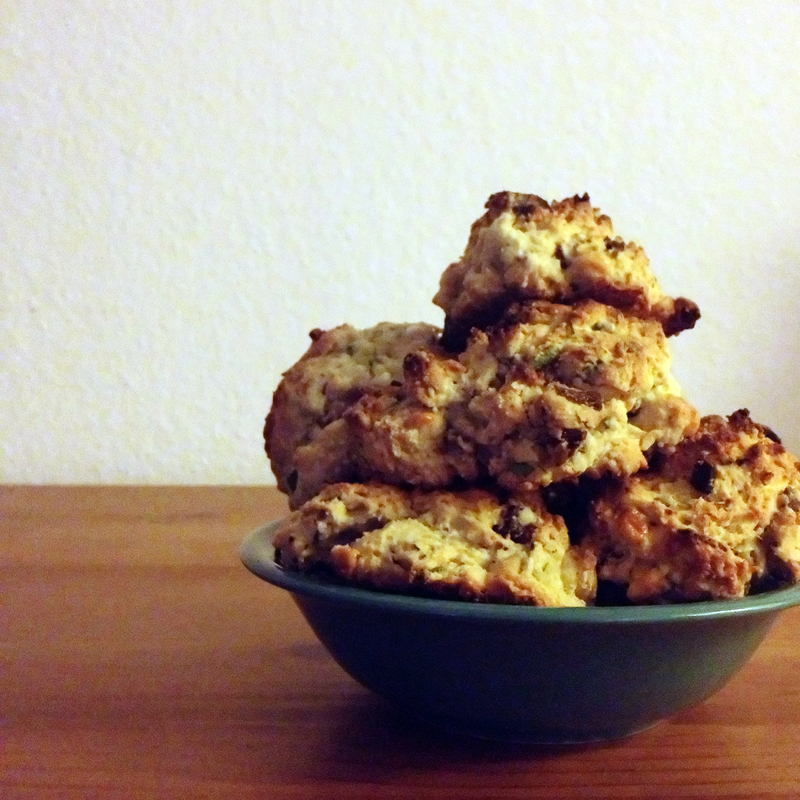 Baking this makes your house smell delicious. I wish there were tartiflette candles. I’d burn ’em all day errday. I love those little bits of crunchy riiiiind too. 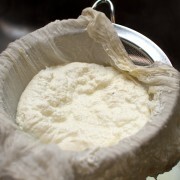 Don’t sleep on cheese rind. 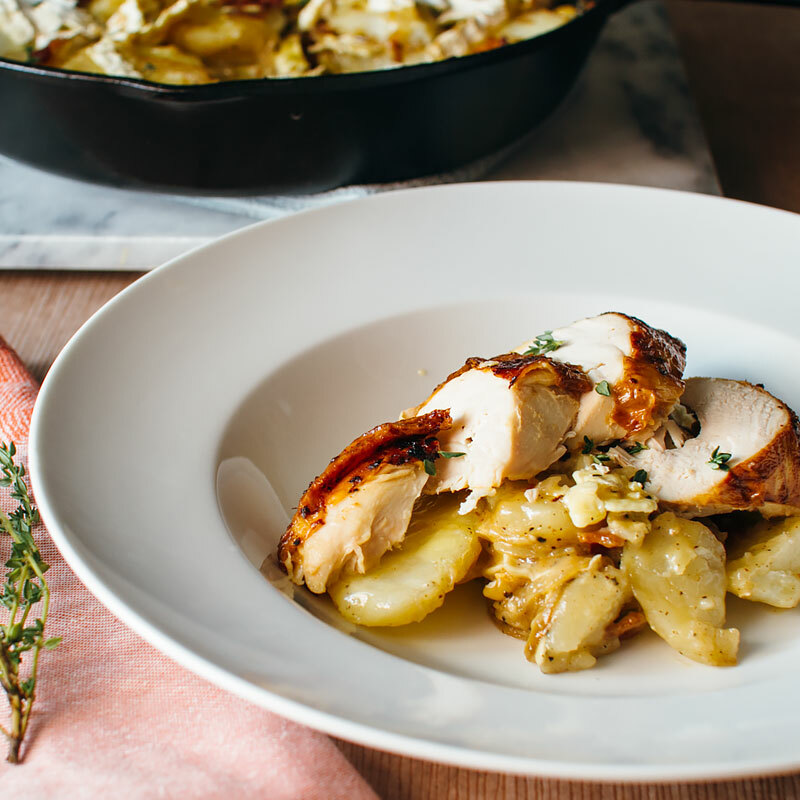 …or with grocery store rotisserie chicken because, lazy. Potatoes. Bacon. Cheese. Wine. What else do you need? Not nothin'. Adapted from Anthony Bourdain. Preheat oven to 350F. Place the potatoes in a pot of water and bring to a boil. 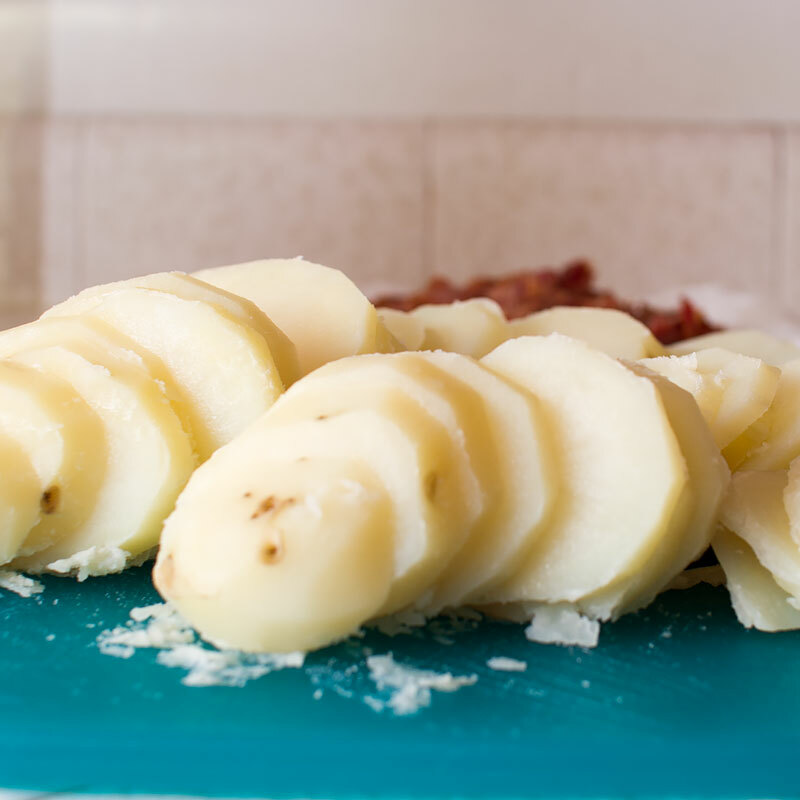 Cook the potatoes about 20 minutes, until just tender and easily pierced with a knife. Drain the potatoes and set them aside until cool enough to handle. Cut into 1/4" slices (or cut them into a small dice, chef's choice). 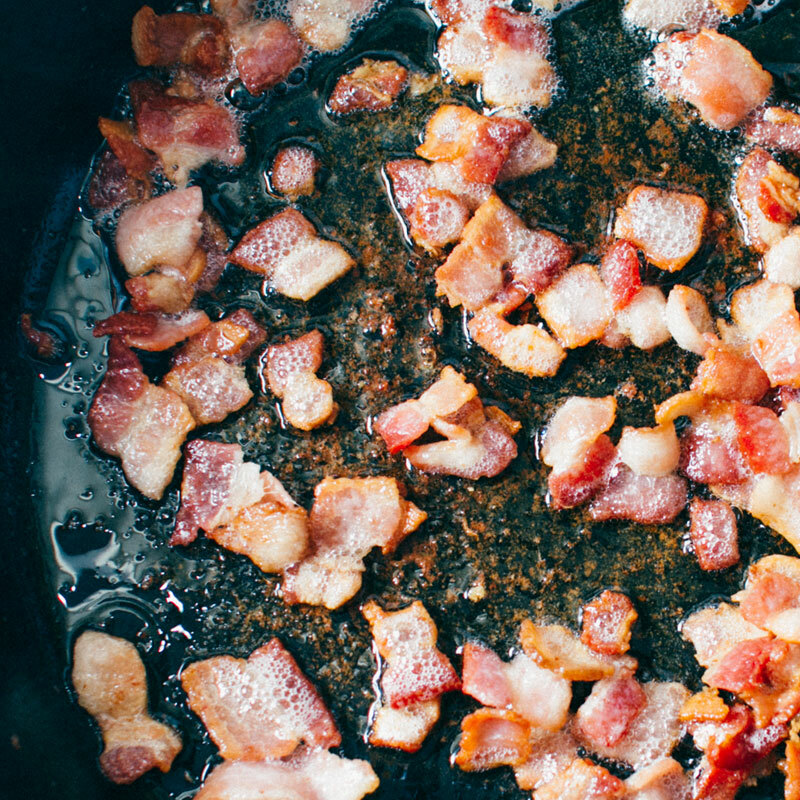 In a large cast-iron or saute pan, cook the bacon over medium-high heat until browned and crispy. Drain on paper towels and set aside. 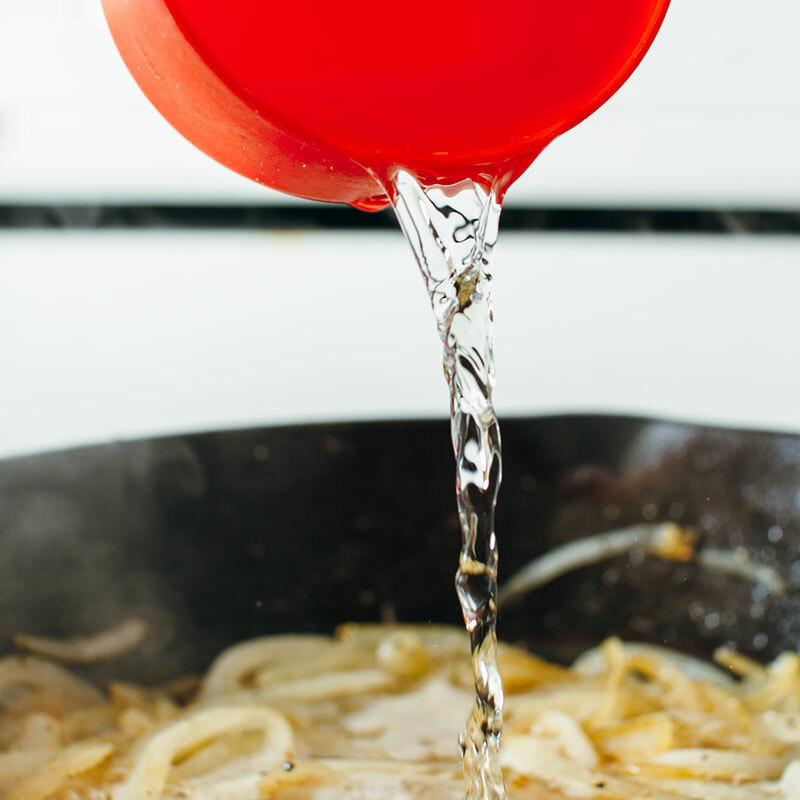 Drain all but 1 tbsp of the bacon fat from the pan and add in the onion. Cook over medium-high heat until browned, about 5 minutes. Add in the bacon and the wine and cook an additional 5 minutes. Add in the potatoes and stir to combine. Season with salt and pepper. If you've cooked this in a cast iron pan, remove half of the potato mixture from the pan (I threw it in the pan I boiled the potatoes in, no need to dirty another pot) and layer on half of the cheese. Top with the remaining potatoes, and the rest of the cheese. 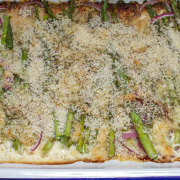 If you're not using a cast iron pan or a pan that can go directly into the oven, do the same layering process in a baking dish. Bake at 350F for 20 minutes, or until browned and bubbling and you can't stand it anymore. Garnish with fresh thyme leaves. Serve hot. 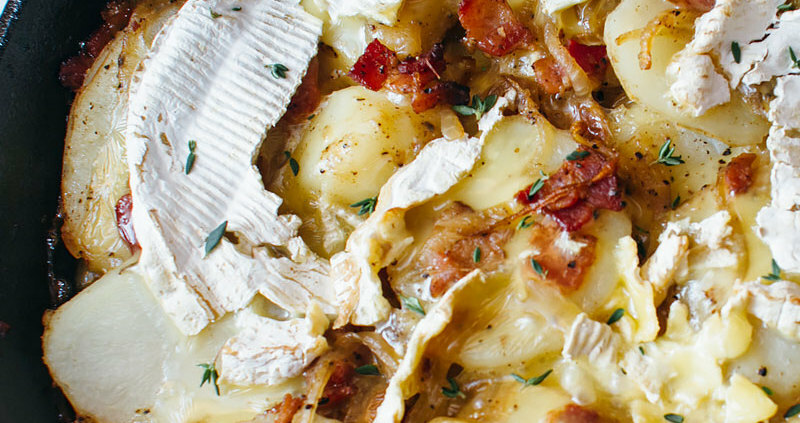 That looks good but Tartiflette is not made with camembert. Thanks, Lily! Did you read the opening paragraph? 🙂 I know it’s made with roblechon, but that’s not available locally, so I used camembert.